The tie that binds the rupee, the rupiah and the peso is their external deficits. All three countries run current account deficits due to the mix of aggressive infrastructure investment, strong consumer demand, and the 2018 oil price surge bloating their respective import bills. This is in stark contrast to countries like Thailand and Malaysia that run current account surpluses and have seen less currency pressure. Crude oil prices have all but doubled in 2018. Global demand has remained solid, and recent sanctions on Iran have weighed sharply on oil supply. The year to date 40% increase in the price of oil benchmarks has bloated the import bill of these three net energy importing countries, even as the volume of their energy imports has remained essentially flat. 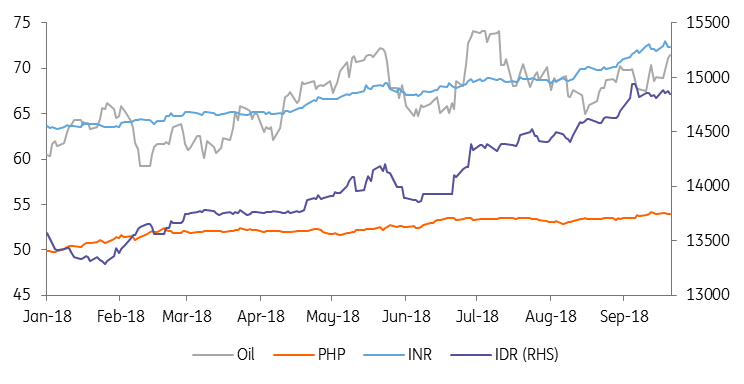 The rise in the energy bill has undoubtedly exerted additional pressure on spot INR, IDR and PHP by boosting USD demand. The oil trade contributes to almost half of India’s trade deficit, underpinning the rupees's abysmal performance this year. To a large extent, the widening trade deficit of these three countries is also a reflection of their strong growth. India, Indonesia and the Philippines are all posting robust growth numbers on the back of strong household consumption and the investment cycle. 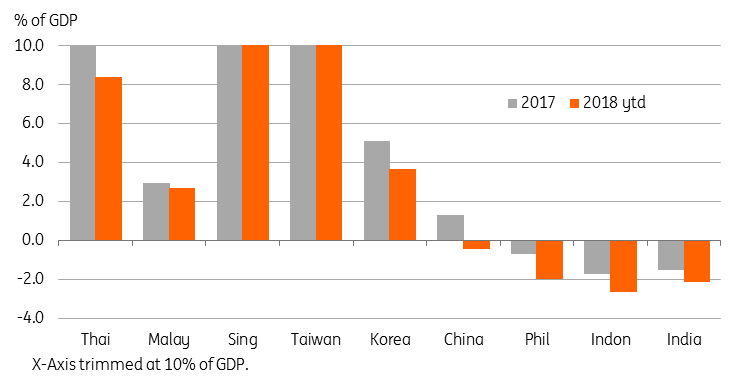 For example, the Philippines has seen a substantial build-up in capital goods imports, ostensibly linked to the accelerated pace of gross domestic capital formation in the first half of 2018. Indonesia is also in the midst of an infrastructure drive as President Joko Widodo looks to fuel his re-election bid, although he has sought to cancel many projects in recent months, as the trade deficit widens. India has seen its import bill increase on the back of strong consumer related imports, in particular smartphones as household incomes continue to rise, and the demand for gold (which isn't really a consumer product) - also seen as a hedge against further rupee weakness. The central bank of Indonesia (BI), the Reserve Bank of India (RBI), and the Bangko Sentral ng Pilipinas (BSP) have all raised policy rates to help alleviate some currency pressure. But the efforts aren't uniform, and some are using other measures in tandem with rate increases to support their currencies. 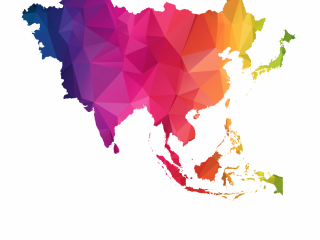 Indonesia is curtailing investments which are heavily reliant on capital imports, while the Philippines has deployed a program to help corporates hedge their USD requirements. And all three countries are looking to issue global bonds in the near-term to plug shortfalls in their financial accounts. However, because they are now doing this so from a position of weakness, they might have to accept whatever the market gives them. Of the three, we believe the authorities in India are dragging their feet in terms of policy response. The measures announced late last week were judged inadequate by the market and the consensus is now building up for more aggressive RBI policy rate hikes, following the relatively modest 50bp hikes this year, compared to 100bp for BSP and 125bp for BI. 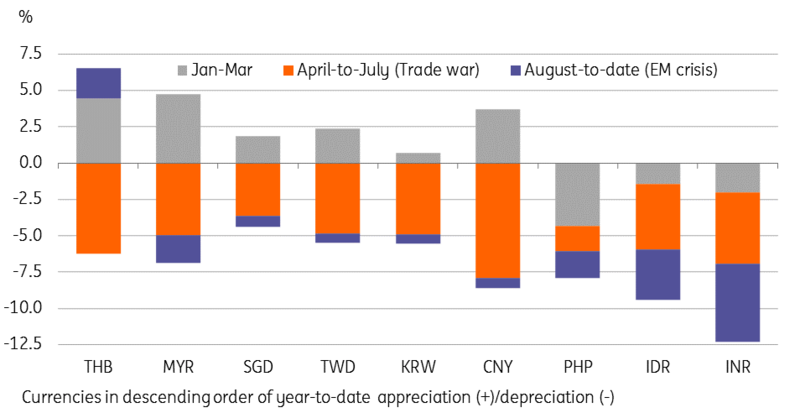 Despite their external deficits, these three currencies may find some additional support if their central banks shore up investor confidence with coherent and credible communications strategies outlining supportive economic policies along with more rate hikes. 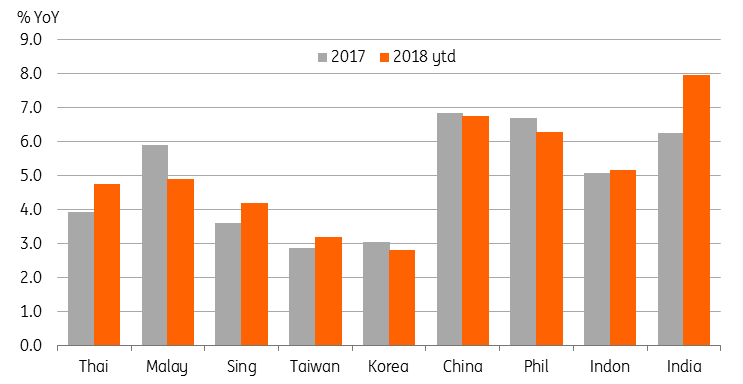 The resulting improvement in investor confidence will support demand for global or corporate bond offerings at lower yields and stronger exchange rates helping these three currencies ride out any future FX storm. For now, markets are taking a breather from the emerging market sell-off that dominated screens until recently. However, potential catalysts for a re-set of global risk aversion remains, possibly stemming from a more aggressive Fed tied to a pick-up in US wage inflation, a ratcheting up of the trade war, despite its waning ability to drive markets or a return to growth-centric policy responses in the three economies we have focused on here. Sentiment appears to be stable at the moment, but a return to stormy conditions might be around the corner.